A sweet and satiric romantic fable about an overworked, overstressed, overpaid investment banker who discovers that the life he leads is no life at all. 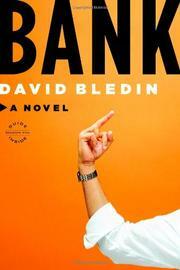 In his debut, former investment banker and economic consultant Bledin, writing what he knows, captures the workplace dynamic from the inside. His first-person narrator is known by all simply as Mumbles, an unassuming Everyman who is often confused with another employee by those above him in the office hierarchy. Pretty much everyone else in the novel also goes by a nickname—the Defeated One, the Star, the Sycophant, the Philanderer, the Prodigal Son—in recognition of the fact that they are perceived less as unique individuals than as replaceable cogs in the investment-banking machine. The 90 hours per week that Mumbles works—and he’s considered a slacker by his superiors—costs him his relationship, such as it is, with the Tenuous Girlfriend, but it helps him make a coffee-break connection with the Woman With the Scarf. Both of them do drudge work for ridiculous salaries—he stands to make over $100,000 as a 23-year-old of little distinction, and is disappointed when his first annual bonus barely tops $20k—but their mutual frustrations provide a common denominator for a possible romance. Mumbles has promised himself that he’ll leave for a job where he feels less stress and more appreciation within two years, but when the Woman With the Scarf starts applying to grad schools, he realizes that he may have to make a potentially life-changing decision. How much abuse can one man stand for how much money? There’s no real plot and the characters are mainly caricatures, but Bledin has an engaging tone that results in an appealing narrator, one who sees his life in terms of popular culture (Groundhog Day, The Graduate, Office Space) and doesn’t take himself any more seriously.